A DARPA-funded research team has demonstrated for the first time in a human a technology that allows an individual to experience the sensation of touch directly in the brain through a neural interface system connected to a robotic arm. By enabling two-way communication between brain and machine—outgoing signals for movement and inbound signals for sensation—the technology could ultimately support new ways for people to engage with each other and with the world. The work was supported by DARPA’s Revolutionizing Prosthetics program, and performed by the University of Pittsburgh and the University of Pittsburgh Medical Center. The results were detailed in a study published online today in the journal Science Translational Medicine and the technology was among a number of advanced demonstrations presented to President Barack Obama today at a White House innovation event in Pittsburgh. The volunteer for the study, Nathan Copeland, has lived with quadriplegia from the upper chest down since a 2004 car accident that broke his neck and injured his spinal cord. Nearly ten years following his accident, after agreeing to participate in clinical trials, Nathan underwent surgery to have four microelectrode arrays—each about half the size of a shirt button—placed in his brain, two in the motor cortex and two in the sensory cortex regions that correspond to feeling in his fingers and palm. The researchers ran wires from those arrays to a robotic arm developed by the Applied Physics Laboratory (APL) at Johns Hopkins University. The APL arm contains sophisticated torque sensors that can detect when pressure is being applied to any of its fingers, and can convert those physical “sensations” into electrical signals that the wires carry back to the arrays in Nathan’s brain to provide precise patterns of stimulation to his sensory neurons. In the very first set of tests, in which researchers gently touched each of the robotic fingers while Nathan was blindfolded, he was able to report with nearly 100 percent accuracy which finger was being touched. The feeling, he reported, was as if his own hand were being touched. These latest results build on a series of DARPA achievements in directly interfacing the brain with a robotic arm. Earlier studies with volunteers Tim Hemmes and Jan Scheuermann demonstrated motor control of the APL arm using a brain-machine interface. “Based on DARPA’s success with those early tests, we asked, ‘Can we do the experiment in reverse and do for sensation what we did for the motor system?’” Sanchez said. DARPA previewed its success with touch restoration in 2015 at “Wait, What? A Future Technology Forum,” an event that brought together thought leaders and expert scientists and engineers to generate new ideas and accelerate the development of novel capabilities. Full, peer-reviewed details of the research are described for the first time in today’s journal article. The interface system is one of two dozen technological breakthroughs on display today at The White House Frontiers Conference, where Nathan and the lead researchers from Pitt talked about the technology, what it could mean for people living with spinal cord injury, and what new possibilities it could open for society. Part of the President’s Brain Initiative, DARPA’s Revolutionizing Prosthetics program is funding research to refine stimulation patterns and incorporate new types of sensations beyond pressure to achieve the goals of delivering near-natural motor control and sensation to users of prosthetics. Improvements in these and related neurotechnologies could someday lead to near-seamless combinations of the cognitive functions of the human brain and the computing processes of machines. Revolutionizing Prosthetics is not DARPA’s only program to pursue the restoration of a sense of touch to amputees. 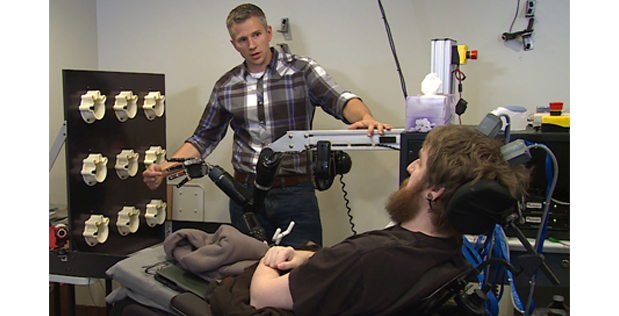 The Agency’s Hand Proprioception and Touch Interfaces (HAPTIX) program is pursuing an alternative approach, using the peripheral nervous system to communicate motor commands and sensory feedback between the brain and a prosthetic limb. The program plans to initiate take-home trials of a complete, FDA-approved HAPTIX prosthesis system by 2019.